BACKGROUND: In 2010 Marine Corps Systems Command (MCSC) along with National Defense Industrial Association (NDIA) hosted its Small Business Opportunities Conference. This event was successful both for the command and the small business community. In February 2018, MCSC leadership directed the planning for another informative platform. 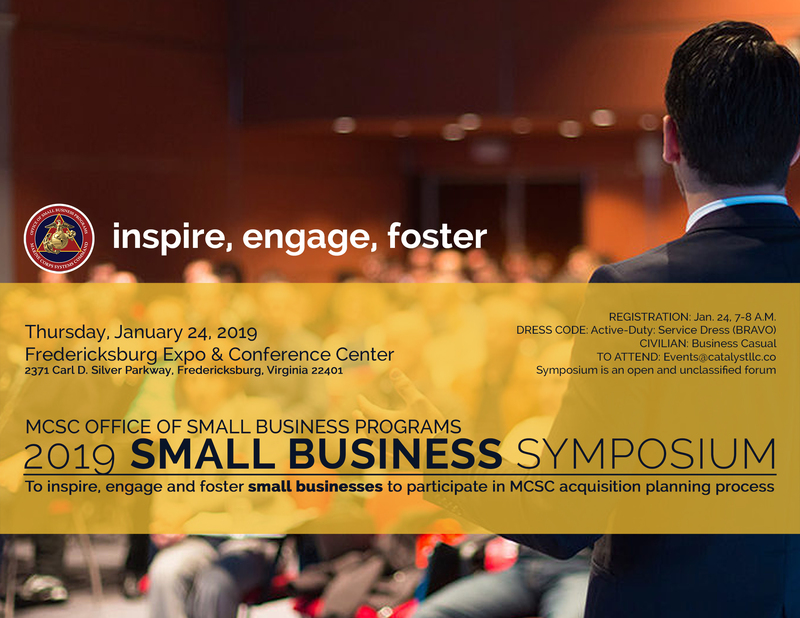 The intent is for MCSC small business providers to engage command leadership and OSBP personnel in an effort to bridge the awareness gap of policy and acquisition planning and highlight MCSC business opportunities. EVENT FORMAT: This is a one-day professional development program that envisions single and panel presentations from subject matter experts within the Marine Corps Acquisition Community including contracting specialists, small business office representatives, portfolio managers and program managers. Sessions will be educational and interactive, including audience question and answer opportunities with speakers. Matchmaking sessions will encourage small businesses to connect and hear directly from subject matter experts about what they do, what they are looking for, and how small business providers can fill capability gaps. Small businesses that previously, currently or intend to conduct business with MCSC, are the intended target audience for participation. ATTENDANCE QUALIFICATIONS: This event is open forum, but requires registration. Technical leads are invited to participate based upon submission of company capability brief to the listed POC. Attendance will be limited to (2) representatives per company. Advance registration is required to attend. Prospective attendees interested are required to complete the following for consideration to attend: 1. Respond to this RFI notice by 5:00 PM on 14 January 2019, the attention of Mr. Austin Johnson at mcscosbp@usmc.mil. Responses after this date cannot be considered. 2. In the response, please submit a company capability brief, not to exceed two pages. 3. Individual company representatives will be contacted and provided an event registration link and agenda information. TOPICS OF INTEREST: 1. MCSC business opportunity forecast and planning process 2. Methods and applications for navigating MCSC business opportunities 3. DoN SBIR/STTR 4. DoN Mentor-Protégé Program 5. Small Business Testimonials.